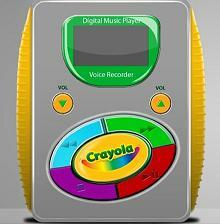 There’s me thinking Crayola only stuck to brightly coloured stationary and unnecessary amounts of crayons, and here it is with its very own MP3 player. There’s no room for swank with this – it’s about as basic (and childlike) as you can get. Forget luxuriously hi-tech gadgetry, this reaches out to your inner child and your love of the plain, the straightforward and the multicoloured technological device. So, other than looking like it opens up to reveal a full set of crayons, the Crayola MP3 player comes with 2GB of storage, five jumbo-sized buttons and mass amounts of letter stickers so you can feel every bit the child, allowing you to regress back to a time when (much to the annoyance of your parents) stickers went on absolutely everything. Just slap an AAA battery in its behind and you’re good to go. With Lego and Digital Blue bringing out a range of Lego-tastic gadgetry later this year, is it possible that 2009 could be the year of the kiddie-tastic gadget?